Sometimes you want to import a lot of markers. Sometimes you want to create multiple maps with slightly different styled markers. Sometimes, copying & pasting marker styles is not enough. Good news: You can give a GeoJSON extra properties (and a CSV extra columns) that define your marker styles before you upload them to the Datawrapper locator tool. That works for point, line and area markers. Attention: This article is a bit advanced. We'll try to do our best to cover everything necessary, but it's definitely an advantage if you've worked with GeoJSONs and CSVs before. Each marker kind can have different properties. We will look at them in the minute – but first, let's define where they go in a GeoJSON and in an CSV. In your GeoJSON, they should go in the section that says properties. In the following GeoJSON, we define the fill color, the outline color and the outline width. In this case, we do this for an area ("polygon"), but we could import line markers or point markers with a GeoJSON, too. // more coordinates go here. In this case, "fill-color" is our property name. "red" is a value. Once you're happy with your properties, you can copy & paste the GeoJSON into step 1: Add markers in the Datawrapper locator maps. 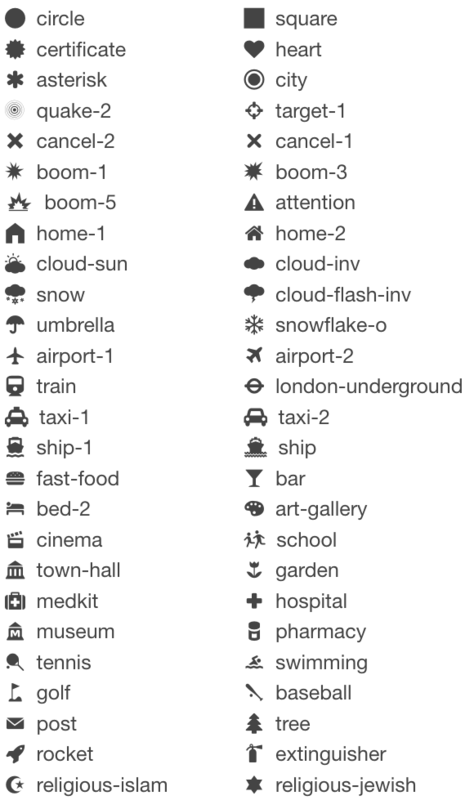 In this case, "icon" is a property name. "flash" is a value of that property. Our property names are in the first row of the CSV; the values are in the rows below. In GeoJSONs and in CSV, there is no need to define all properties explained in this article. The properties that you don't define by hand will be set to the default value. Also, your GeoJSON or CSV might have additional properties defined. Don't worry about them. Datawrapper looks only for the property names explained in this article and ignores the rest. Once you're happy with this styling, click on the "Import GeoJSON or CSV" button in step 1: Add markers. Choose your CSV and click "ok". Your points should now appear on the map. name Name, NAME, title, Title, TITLE Any word or phrase (e.g. "subway line"). This text won't appear on the map, but only in the marker list. opacity stroke-opacity Any number between 0 and 1.
stroke-width line-width Any number between 0 and 20.
opacity -- Any number between 0 and 1. You can also define "stroke-opacity" and "fill-opacity" separately. line-width stroke-width Any number between 0 and 20.
name Name, NAME, title, Title, TITLE Any word or phrase (e.g. "Empire State Building"). This will be the marker text. icon symbol A valid name for one of our icons. You can go to our locator tool and hover over the icons to get to know their names. You can also find them as a list below. tooltip -- Any word or phrase. This will be the tooltip text. HTML works, too. 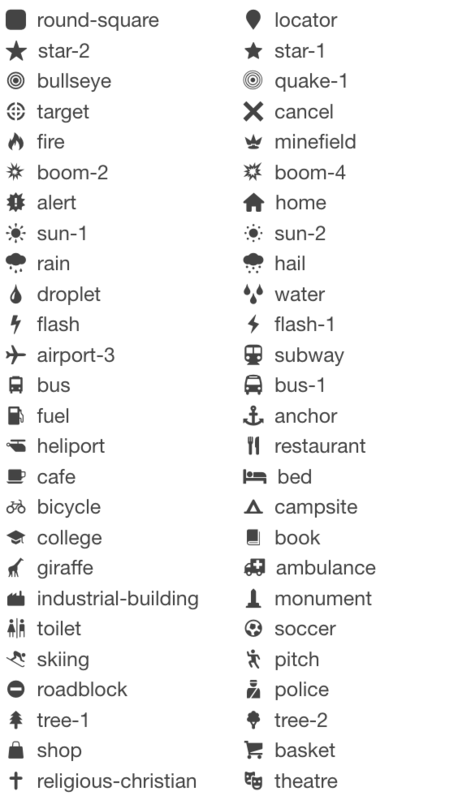 Here you can find all the symbol names you can reference when creating pointer marker.